Sun and rain battled for undivided attention, as I looked out from the observatory tower of the PAG-ASA Weather Station—a structure that curiously looked like something out of The Jetsons—desolately perched above the rolling rainforest of the island’s foggy mountain range. In a matter of minutes the weather changed from sunny to cloudy to, well, very wet. And far below, the ocean tossed against the steep coastline that crumbled into the churning waters to form rocky islets. To even the most ardent of travelers, Catanduanes is nothing but the weatherman’s darling. Even summer days are marked by weather so fickle that spotting Mayon Volcano across the Maqueda Channel from the southern coast can be a game of hide and seek. Floating out from peninsular Bicolandia out to the Pacific Ocean, this rough-hewn island of over 1,500 square kilometers is situated in the middle of a typhoon freeway along the easternmost fringe of Luzon, earning itself the uninviting label of “The Land of the Howling Winds.” But it is this sheer isolation that has guarded the raw beauty of the place, where nature’s elements—earth, wind and water—collide to give birth to a unique tropical landscape that summons those seeking the adventure and repose of roads less-traveled. The yearlong rains are soaked up inland by dense foliage nourished to the most vivid of greens. Percolating through the mineral-rich mountains, the water has whittled out several caves. 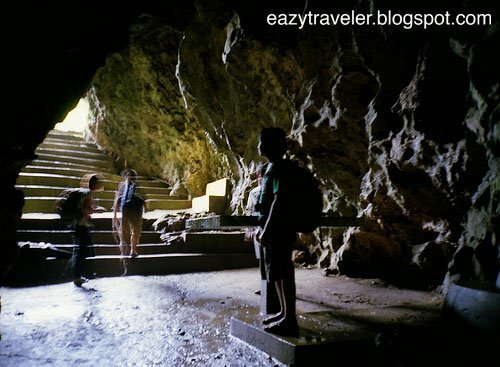 Along the Virac-San Andres highway, the historic Luyang Cave provides a humid retreat to some chirping bats, perhaps the very descendants of those that witnessed the cruelty of 17th century Muslim pirates, who upon discovering the natives’ asylum suffocated the refugees with smoke. Nothing but the cave itself remains as a concrete reminder of such an unfortunate tale. Centuries of rainwater have long purged the place of its terrible past, nurturing unperturbed pulchritude in its place. Nearby, a brook carries orange petals showered by the forest canopy, while butterflies and lizards seek respite along the water’s edge. After saturating the soil, runoffs converge into powerful streams that flow through the jungle. 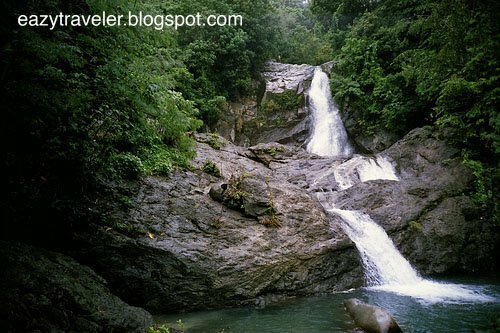 Just minutes away from the provincial capital of Virac, Maribina Falls at Bato is a popular spot among weekend frolickers who take pleasure in cooling down within its cascading waters and basking on its mossy boulders, as residents take the opportune afternoon, when rainclouds abruptly withdrew, to gather wild sili and gabi (chili and taro) used to make the spicy native dish of laing. Meanwhile, other men dive for sugpo (prawns) hiding within the deep pools. Clambering up the highest cataract, I could see where all the thundering water was headed for. Above the trees, I glimpsed the Pacific Ocean. The water takes a calmer pace as it traverses the narrow plains between mountain and sea, where most Catandunganons have settled since the scions of Panay’s legendary Ten Bornean Datus set foot on the island in the 13th century. Since then, the island has been for mariners a katandungan—a Malay word for refuge. As some historians point out, this reference gave the province its name. Since the Christianization of the island under Spanish rule, its rivers have been cradles of faith. Erected in 1830 along the wide Bato River in honor of St. John the Baptist, Bato Church squats pensively overlooking the coffee-colored waters with her stain-glassed eyes framed by a three-meter thick face of coral and river stones. In San Andres, a smooth stone no larger than a stampita has reputedly grown with the people’s religious convictions. A farmer found the stone etched with the image of the Virgin Mary on a nearby riverbank. Once only as small as a thumbnail, the miraculous stone has increased in size, and is now enshrined in a modest chapel in Batong Paloway devotedly visited by pilgrims. At their termini, rivers and other tributaries succumb to the surfer’s transcontinental playground. Ever since some Australian shortboarders discovered that a cove in Baras harbored long-barrel waves perfect for surfing in the 1970s and called them the “Majestics,” adventurers—mostly foreigners—have braved landslide-prone rough roads and tempestuous weather to relax on the shifting golden sands of Puraran Beach, and conquer waves that reach well over 10 feet in height during typhoon swells. When the winds die down during the summer months, non-surfers can swim, snorkel or simply wade over the tidal pools that shelter gentle brittlestars and giddy mudskippers. Jana Wettich and Julien Espinassou, a European couple traveling through Bicol, took time—after meeting the whale sharks in Donsol, Sorsogon—to unwind in Puraran. “It’s particularly nice here, it’s calm and not crowded. We have our cottage, our little home with a beautiful view of the ocean,” they share as we sat in a nipa hut admiring the coconut palms drenched in cloud-tempered light. “And the food—it’s really great here,” Jana adds. After feasting on a generous platter of steamed rock lobsters, sweet and sour lapu-lapu (grouper), crab curry and laing, who could possibly disagree? In the distance, I observed fishermen wallow into the reef break to spearfish, probably for our evening dinner. Consequently forged by unrelenting nature and history, the island’s charm ultimately lies in the resilience of the Catandunganons: the abaca growers hauling sun-dried hemp oblivious to the passing rain; or the young parish secretary in San Andres patiently indexing on a typewriter fragile volumes of 19th century church records filled with exquisite calligraphy all faded and bleeding after having survived countless storms; or even the farmers plowing the rice paddies with their carabaos alongside the angry waves of the ocean that once carried the abaca hemp to Mexico aboard magnificent Spanish galleons. Upon descending the eastern hill of Puraran Beach dotted with wind-ravaged banana trees to admire the citrus sunshine spilling into the cove, some rice farmers welcomed me to join their planting. I was amazed to see rice fields meters away from saltwater. A stream that drained away onto the beach irrigated the paddies. And as the farmers spoke of their weather woes with an undaunted smile, they inserted the rice seedlings in the sand-toughened mud with such methodical determination. Even Spanish conquistadores cannot swiftly subjugate Catandungan’s temper. On April 25, 1576, Fray Diego de Hererra, an Augustinian confrere who established the Basilica Minore del Santo Niño in Cebu with explorer Miguel Lopez de Legazpi, was shipwrecked off the coast of barangay Batalay in Bato, due to bad weather. Eventually, natives who rejected Catholicism martyred the priest. According to tradition, a Spanish companion planted a cross on his gravesite, where spring water miraculously flowed. And as supernatural punishment for killing a holy man, the natives were attacked by a school of swordfish. Today, an unfinished shrine stands on the priest’s final resting place, housing the original cross, encased in narra hardwood. Tricycles and jeepneys can take you to most of the attractions. But to get to distant places like Puraran Beach, 1 ½ hours north of Virac, it’s best to rent an SUV (see Where to Stay). As of the time of writing, the construction of the circumferential road is still underway, leaving many portions challenging to negotiate. If road conditions permit, one can still take a jeepney from Virac to Baras (P35), then a tricyle to Puraran Beach (P150). At Puraran Beach, conquer the waves or simply relax at Elena’s Majestics Beach Resort. Bamboo cottages with private showers are rented out at P350 per night for double accommodation. Shortboards and snorkeling gear are available for guests as well. Elena’s Majestics Beach Resort, Brgy. Puraran, Baras. Contact Aireen Tanael at +639195581460 or e-mail at aitanael@yahoo.com. At Virac’s seaside boulevard, you definitely won’t be under the weather chilling out at Sea Breeze Restaurant with scrumptious battered rock lobster in chili sauce (P700 per kilo) and some ice-cold beer (P33). Sea Breeze Restaurant, Pier Site, PPA Bldg., Salvacion, Virac. Tel. + 63 (52) 8110664. Puraran’s best kept secret is its food. Elena’s Majestics Beach Resort (see Where to Stay) serves up mouth-watering dinner platters of seafood, vegetables and fresh fruit at only P125.00 per head.